In the woods one day, my friend Jocelyn saw me eat an Oregon grape, tried one herself, and screamed. I was unfazed; just after my daughter, not yet two years old, had eaten her first Oregon grape, she had pantomimed death throes. If you were to taste one of these little not-grapes—and I urge you to try one—you too might guess that they were poisonous, for they are very tart and a little bitter. But they are rich in pectin and make a fine jelly. Nearly black in color, the jelly has a grape-like but spicier flavor. In either its tall or short form, Oregon grape, Mahonia, is an evergreen shrub with prickly, holly-like leaves and bright yellow blossoms. Though native only to the Pacific Northwest, from northern California to southern British Columbia, the plant is widely grown elsewhere for its beauty and its drought-resistance. I saw it growing in public beds all over Paris, often along with another Northwest native, red-flowering currant. 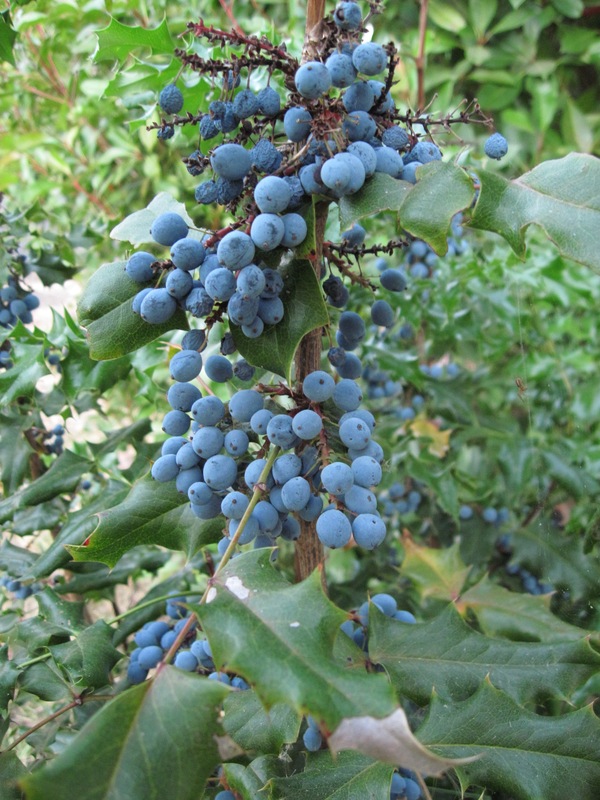 In summer, Mahonia’s yellow flowers turn to blue berries that hang on the plant for several weeks. The berries are ready to pick when they’re uniformly dark. For three half-pint jars of jelly, you’ll want to collect about three and a half pounds of berries. Just slide your fingers down each bunch, and the berries will fall into your basket. It’s easy to extract the juice of Oregon grapes with a steam juicer. If you don’t have a steam juicer, simmer the berries, covered, with half their volume of water for fifteen minutes, mashing them after the first ten minutes. Drain the juice through a jelly bag—let the juice drip for several hours—and then boil it for ten minutes to reduce it a bit. From this point on, making jelly is quick and easy. Combine the juice and sugar in a wide, heavy-bottomed, nonreactive pan (that is, a pan with a stainless-steel or well-enameled interior surface). Place the pan over medium heat. Stir until the sugar is dissolved, and then raise the heat to medium high. Boil the syrup, skimming occasionally, until it begins to jell. This will take only a few minutes. You can test for jelling by scooping a little of the syrup with a metal spoon and then tipping the spoon high over the pan. You’ll see the drops thicken and slow, and then two drops will run together. That’s the point at which you remove the pan from the heat. Skim any remaining foam from the surface of the syrup. Immediately pour the syrup into three sterilized half-pint mason jars. Add the jar lids and rings, and process the jars in a boiling-water bath for five minutes. Remove the jars from the water bath, and let them cool on a rack or pad. Leave them alone until the next day, when the jelly should be firm. This entry was posted in Fruits, Sweet preserves, Wild foods and tagged food, foraging, fruit, jelly, Oregon grape, recipe. Bookmark the permalink. I wonder if you have a recipe for Oregon Grape pancake syrup? We are on Vancouver Island, and have an abundance of them. I’ve never made Oregon grape pancake syrup, but you could apply the standard USDA method for making fruit syrup: Combine 5 cups strained juice with 7 cups sugar, and simmer 1 minute. The only trick to this method is keeping the syrup from turning to jelly–a real risk with fruit as high in acid and pectin as Oregon grape is. Be sure you don’t let the simmering go on longer than a minute. If you end up with jelly anyway, try pouring the syrup into jars as soon as it comes to a boil. The recommended processing time, for half-pints or pints, is 10 minutes (at 0 to 1,000 feet). The berrys from this plant are delicious. I just ate them in a salad my dad made. Thanks for this great website where everyone is welcome to take part! Mahonia–at least two Oregon species, Asian species, and hybrids–are widely available in nurseries here in Oregon. To my knowledge, the fruit never appears in markets. Have you seen it sold in other countries? I’ve had a huge Oregon Grape plant in my yard for the last 38 years and never knew the grapes weren’t poison. My plant is loaded down with the fruit so now I need to make a lot of jars of jelly. I do have a question, can you safely double the jelly recipe or must you only make three jars at a time? In making jelly, it’s best to work with small quantities. First, you’re limited by the size of your pot. You want to boil the syrup rapidly, and you can’t do that if the syrup is threatening to boil over. Second, pectin works best when it is heated and cooled rapidly. A larger volume slows down the heating. If your stove and cooking pot are typical of home equipment, I’d advise you to stick with three jars at a time. I made syrup with these a few years back. It passed Maple as the family fave. Just went out and got myself 20 lbs. Christmas gifts this year. I’m thankful for being offered the gift of plants in this autumn season. I’ve long been wanting to add grapes to my urban landscape, for not only the wildlife, but for our own enjoyment! I’m loving this little blog post on the eating (and jelly-ing!) of the Oregon Grape and am re-blogging it to remind myself of the harvest to come! Thank you for writing it, Linda! Makes me curious as to what these grapes taste like. It’s cool to see that people still can fruits and vegetables. Hardly anyone likes raw Oregon grapes, but they make excellent jelly. What is ‘stevia in the raw’? Ironically, Carole, Stevia in the Raw is processed stevia, in granulated form. I have never used it myself. Thanks for your very straightforward recipe and hints. This year’s Mahonia crop is voluminous here in my Spokane yard! I’m going to give the jelly a whirl.